E.O. Wilson, one of the world’s greatest scientists, is also a Pulitzer Prize-winning author who has published over twenty-five books. Here David Attenborough and Harrison Ford introduce the breadth of Wilson’s vision. The following are excerpts from E.O. Wilson’s acclaimed book The Diversity of Life. In this 1992 work, Wilson reflects on the evolution of life and man’s destruction of the natural world. The sixth great extinction spasm of geological time is upon us, grace of mankind. Earth has at last acquired a force that can break the crucible of biodiversity. The creation of that diversity came slow and hard: 3 billion years of evolution to start the profusion of animals that occupy the seas, another 350 million years to assemble the rain forests in which half or more of the species on earth now live. There was a succession of dynasties. 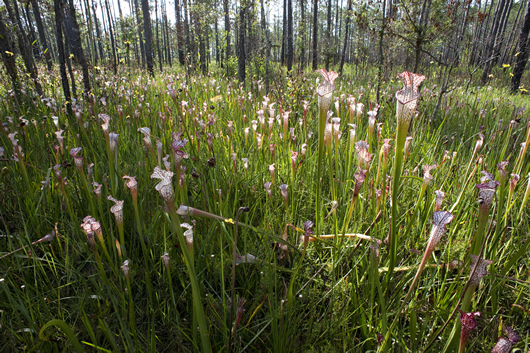 White top pitcher plants, Splinter Hill Bog, Baldwin County, Alabama. Photograph by Alex Harris. [U]nlike the rest of science, the study of biodiversity has a time limit. Species are disappearing at an accelerating rate through human action, primarily habitat destruction but also pollution and the introduction of exotic species into residual natural environments. I have said that a fifth or more of the species of plants and animals could vanish or be doomed to early extinction by the year 2020 unless better efforts are made to save them. This estimate comes from the known quantitative relation between the area of habitats and the diversity that habitats can sustain. These area-biodiversity curves are supported by the general but not universal principle that when certain groups of organisms are studied closely, such as snails and fishes and flowering plants, extinction is determined to be widespread. And the corollary: among plant and animal remains in archaeological deposits, we usually find extinct species and races. As the last forests are felled in forest strongholds like the Philippines and Ecuador, the decline of species will accelerate even more. In the world as a whole, extinction rates are already hundreds or thousands of times higher than before the coming of man. They cannot be balanced by new evolution in any period of time that has meaning for the human race. 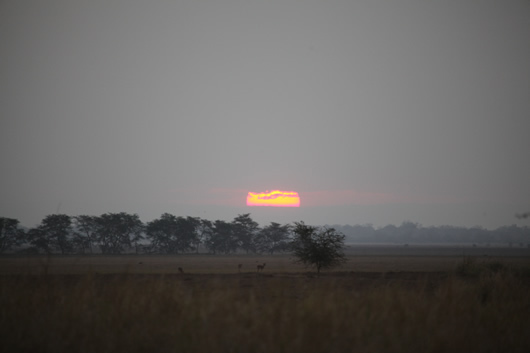 Sunset over the winter-season floodplain, Gorongosa National Park, Mozambique. Why should we care? What difference does it make if some species are extinguished, if even half of all the species on earth disappear? Let me count the ways. New sources of scientific information will be lost. Vast potential biological wealth will be destroyed. Still undeveloped medicines, crops, pharmaceuticals, timber fibers, pulp, soil-restoring vegetation, petroleum substitutes, and other products and amenities will never come to light. It is fashionable in some quarters to wave aside the small and obscure, the bugs and weeds, forgetting that an obscure moth from Latin America saved Australia’s pastureland from overgrowth by cactus, that the rosy periwinkle provided the cure for Hodgkin’s disease and childhood lymphocytic leukemia, that the bark of the Pacific yew offers hope for victims of ovarian and breast cancer, that a chemical from the saliva of leeches dissolves blood clots during surgery, and so on down a roster already grown long and illustrious despite the limited research addressed to it. It is easy to overlook the services that conserved ecosystems provide humanity. They enrich the soil and create the very air we breathe. Without these amenities, the remaining tenure on Earth of the human race would be nasty and brief. The life-sustaining matrix is built of green plants with legions of microorganisms and mostly small, obscure animals—in other words, weeds and bugs. Such organisms support the world with efficiency because they are so diverse, allowing them to divide labor and swarm over every square meter of the earth’s surface. They run the world precisely as we would wish it to be run, because humanity evolved within living communities and our bodily functions are finely adjusted to the idiosyncratic environment already created. Mother Earth, lately called Gaia, is no more than the commonality of organisms and the physical environment they maintain with each passing moment, an environment that will destabilize and turn lethal if the organisms are disturbed too much. A near infinity of other mother planets can be envisioned, each with its own fauna and flora, all producing physical environments uncongenial to human life. To disregard the diversity of life is to risk catapulting ourselves into an alien environment. We will have become like the pilot whales that inexplicably beach themselves on New England shores. 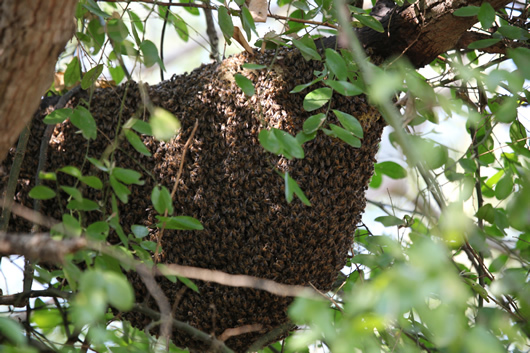 The bees on this sagging colony are quite still until disturbed. Gorongosa National Park, Mozambique. Humanity coevolved with the rest of life on this particular planet; other worlds are not in our genes. Because scientists have yet to put names on most kinds of organisms, and because they entertain only a vague idea of how ecosystems work, it is reckless to suppose that biodiversity can be diminished indefinitely without threatening humanity itself. Field studies show that as biodiversity is reduced, so is the quality of the services provided by ecosystems. Records of stressed ecosystems also demonstrate that the descent can be unpredictably abrupt. As extinction spreads, some of the lost forms prove to be keystone species, whose disappearance brings down other species and triggers a ripple effect. The loss of a keystone species is like a drill accidentally striking a power line. It causes lights to go out all over.